Large town in Kent, England, containing the metropolitan cathedral. Jews were settled here in the twelfth century. They seem to have been on very good terms with the monks, taking their side in a controversy with the archbishop. Gervase of Canterbury ("Chronicles," i. 405) was struck by the contrast between the archbishop excommunicating the monks and the Jews praying for them. Reference is made to the inn of a Jew at Canterbury (Robertson, "Materials for Life of Becket," ii. 7). 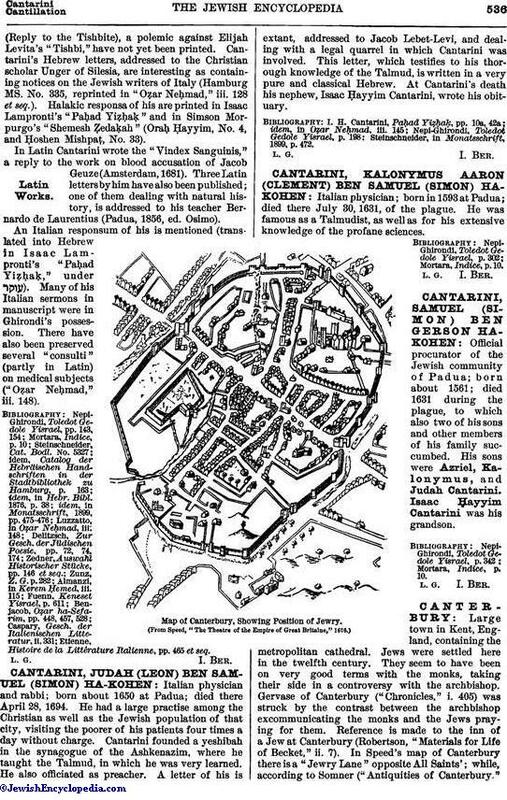 In Speed's map of Canterbury there is a "Jewry Lane" opposite All Saints'; while, according to Somner ("Antiquities of Canterbury."pp. 124, 125), the site of the ancient synagogue was that of the Saracen's Inn. Only two rabbis of any importance are said to have been connected with the town of Canterbury. These are Aaron of Canterbury and Benjamin of Canterbury, the latter of whom Joseph Jacobs has attempted to identify with a Benjamin of Cambridge (see Cambridge). The community preserved its importance up to the Expulsion, as it was the seat of an archa or chest for the preservation of deeds. 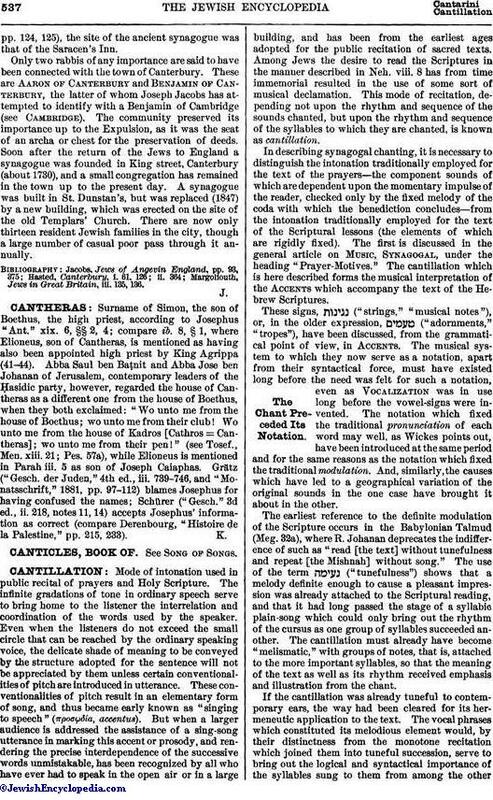 Soon after the return of the Jews to England a synagogue was founded in King street, Canterbury (about 1730), and a small congregation has remained in the town up to the present day. A synagogue was built in St. Dunstan's, but was replaced (1847) by a new building, which was erected on the site of the old Templars' Church. There are now only thirteen resident Jewish families in the city, though a large number of casual poor pass through it annually. Margoliouth, Jews in Great Britain, iii. 135, 136.